Watching the forecast is almost an obsession right now. The coming storm is being built up a lot and we certainly hope it materializes. It's too early in the forecast to see accumulation predictions, but hopefully it's going to be a dumper. 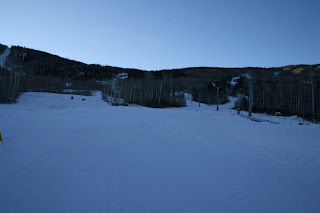 Temperatures are still very low this morning so we're still making snow around the base area. If this storm is as big as they say, things are going to get very interesting around here this weekend. I'll be in contact with the mountain crew each morning and will continue to post updates. As soon as we make the decision about opening, I'll hit the web, TV stations, newspapers and radio. If you're in our text message club, you'll get an alert sent straight to your phone. If you want to sign up for that (it's free) go here. If the storm goes as predicted (and we all know how erratic weather can be), would you be looking at openinng Monday/Tuesday? We are coming in on Saturday and I am trying to make plans accordingly. Yes, that's what we're looking at. But don't be mad at me if the weather doesn't cooperate! :) I feel like I'm walking the line here trying not to do anything to chase off the storm. Getting a little too superstitious!